I haven't watched Friends in years, so I wasn't sure if I'd emotionally connect with the finale. Gavin and Sheila hosted a finale party, though, and even though I don't have an office job anymore I still feel the need to be armed for water cooler conversation. Turns out I hadn't missed much. The characters are still exactly the same, ten years later. Oh sure, some have gotten married, some have kids, etc., but the only thing preventing the show from running along forever were the movie ambitions of a few of the actors and the unpleasant effects of aging. 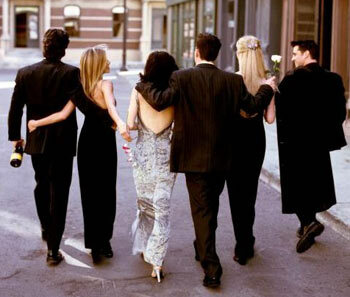 The first two years of Friends came out just as I was finishing college and entering the real world and thus it appealed to me in a firsthand way (even though I had a job that should have paid me more than all of them yet they lived in a palatial apartment in New York). After those years, it was never must-see TV for me. Its humor never cut too deep, and thus I can barely remember any memorable episodes. Compare that to Seinfeld or The Simpsons, from which I could cite a dozen references or episodes off the top of my head. Still, Friends was like comfort food. On an open Thursday night, it was pleasant to the taste and familiar and reassuring in the fairy-tale manner of all great sitcoms. Fortunately, for fans, in a year or two all the seasons will have come out on DVD (not to mention syndication) where the six of them will live on forever. It will be as if the show was never canceled.